Google Noticeboard is a new service from Google Labs India that intends to improve the way Indian communities share information online. Google Noticeboard is an application that helps people access and share information over the Internet using public digital noticeboards. Using Google Noticeboard, communities can access a variety of relevant information. 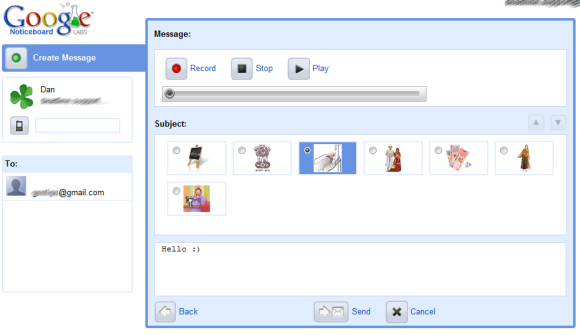 People can create text messages or record voice snippets and post them to one or more noticeboards. Typically each digital noticeboard carries publicly accessible messages. Compared to the notion of personal communication using email accounts, the Noticeboard metaphor allows user to engage in public communication with communities. Noticeboard uses a Firefox extension and requires to enable IMAP in Gmail to send messages. The service seems to be aimed at people that don't own computer and don't have an email address, but the interface is very basic and limiting. Google Noticeboard's user guide (PDF) has more information. broken link, anyone got a better one? ... or, to quote Google's CEO, this could be the "poor man's email". Here's a screenshot from the homepage and a link to the extension. why is it not for Chrome ? You add media extensions to google groups and you have a the same thing but better. I get the feeling we don't understand it. I know for instance that I don't understand it- although I am very curious. I have been on the market for some sort of community noticeboard for my neighborhood and this looks intriguing but I don't know how to use it really. For one- there is mention about the administrator setting the thing up- how is that done? Let's say I want to administrate it. This is the first product which scared me. thanks google. tried to install after updating to firefox 3 but got error notice: not Firefox-Build-Typ (Darwin_x86-gcc3)compatible. any suggestion- I am keen to try it.